TERRAIN Undulating & granite outcrops called kopjes Sandy with many rocks Tall grass with few trees esp acacia thorns WARNINGS Wear long sleeves Thorns ripped my forearms Take spare tubes puncture repair kit & pump TRAILS Not purpose-built MTB track but network of interlinked walking paths So not wide or flowing & no berms custom jumps or switchbacks Challenging as they twist & turn thru bush erratically narrow & closely skirt thorny trees Many rock gardens - from beds of small rocks & rock-paved paths thru rock faces & drop offs to downhill bits with 0.5 to 2m boulders Also â€œrock pinchesâ€ very narrow (8-20cm) between rocks up to 0.5m high Some paths worn 20cm into ground Singletracks narrow (~30cm) with long (1m) grass concealing rocks LOOP No marked trails Leave carpark, go N toward boom gate turn R to BBQ area L onto indistinct track Skirt kopje & cross dam wall thru rocks to dirt road climbing great rock garden Take R fork & 20m turn R onto singletrack with rock drop offs & pinches Cross road & wind thru grass (hidden rocks) Cross road onto red dirt track Couple of rock gardens most rideable Track ends @ steps to Upper Dam wall Just before turn L Ramp over rock ledges to edge of Upper Dam Follow along stone wall Join double track 20m then turn R onto singletrack. Follow until it joins double track Turn R Pass picnic & fishing sites Appears to end at back gate of a house Turn R onto singletrack just before. 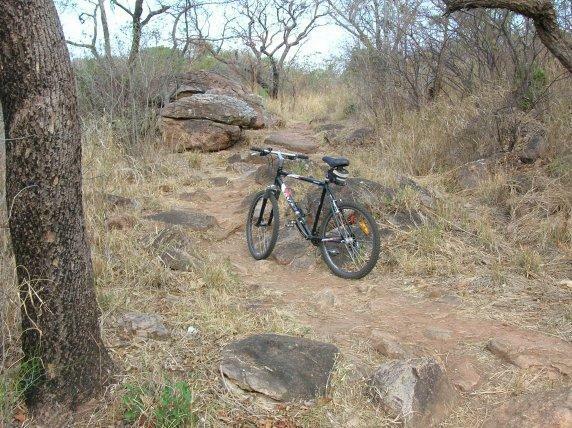 Curve R & climb 30-40m rock garden up & 30-40m down All singletrack from here Follow thru rock pinches & small step climbs. Take L forks to more & bigger rock pinches for 1-2 km to fork Go R along river bank on well-worn path Leads to ford & rock garden climb Many paths but all turn N thru couple of tall & daunting rock pinches & up onto rideable rock face Carry bike up 1st climb to rideable (trust me!) downhill. Follow path 150m to 2nd climb Navigable downhill section then more climbing over rock faces & large buried boulders to short downhill rideable on R side Couple step climbs to fork Turn L Climb v difficult rock garden Skirt a kopje & turn R Follow root- & rock-ridden path to W end of Upper Dam wall Go 5m & turn L onto 1st rock path down Follow round sharp R curve & down steps to wide, straight path lined with trees and onto road back to car park Real excitement was exploring virgin MTB trails plus the diversity of intricate interwoven network of tracks not exhausted after 2 months So donâ€™t stick to loop Explore! RULES OF ROAD Pedestrians made paths They have right of way Met very few but most surprised so go easy Stop & pull over or call out (Remember thanks!) Otherwise hit it hell for leather! Review: I returned here in 2011. The dams have been fenced off and the paths are no longer used as much. As a result most of the paths on the western side of the dams are so overgrown as to be difficult to see and almost impassable in places. I cleared the worst of the overgrowth on the eastern side and rode the paths again for a couple of months. It's still great fun. Review: Itâ€™s not a purpose built MTB track, but a network of interlinked walking paths. The paths are therefore not the wide flowing trails I am used to, but are really challenging in that the twist and turn through the bush erratically, are often quite narrow and closely skirt the (very thorny) trees. There are no berms, custom jumps or switchbacks, but there are rock gardens aplenty â€“ varying from beds of small rocks and rock â€œpavedâ€ paths through some interesting rock faces and drop offs to spectacular downhill bits negotiating boulders 0.5 to 2m (2 to 6 foot) in size. Some of the last type of rock gardens looked impossible unless youâ€™re Sam Hill or Steve Peat, but because these paths were made to walk and climb on foot, the transitions between are human step size and even my hardtail cleared them well. A wild ride at times but quite doable. Another feature of these paths is what I came to call â€œrock pinchesâ€ â€“ a very narrow path (at times only 8-10cm (3-4 inches)!) wending between rocks up to 0.5m (2 feet) high. It is often impossible to pedal and, going uphill, the only way to keep momentum is rachetting the pedals. Some of the paths have been used for decades and have been worn 20cm (8 inches) into the ground. These are difficult to ride as the pedals hit the side of the path â€“ forcing you to either power through or ramp up onto the edge of the path and ride parallel to it. The single tracks are narrow â€“ 30cm (1 foot) on average. The grass grows right to the edge and often 1m (3 feet) high. This can and does conceal rocks. My pedals took a beating! There are a couple of places on the west side of Upper Dam where it is not possible to ride and I had to pick up my bike and climb. Maybe world class XC riders could do those sections, but I have my doubts! For me the real excitement was exploring virgin MTB trails. Few of these trails are ever ridden (only walked) â€“ in fact a couple of the few times I encountered people on the trails they expressed surprise that anyone would/could ride them. It is clear they are not made for MTB: you can be zooming along a clear sandy track when suddenly are presented with a nasty rock pinch, a set of rustic stairs or it just ends at a vertical rock face next to what appears to be a fishing spot. But it was just that unpredictability which provided the excitement plus the diversity of the intricate interwoven network of tracks that I am not sure I exhausted after 2 months of riding there 3-4 times a week. Hillside Dams MTB Trail 4.00 out of 5 based on 2 ratings. 2 user reviews.